Instagram has more than 800 million visually inspired users – half who visit the image-based platform every day, estimates SOCi, the leading enterprise solution for large-scale social media and marketing management. The fastest growing social media network, launched in 2010 and acquired by Facebook in 2012, has evolved and expanded to become the place to be to boost brand awareness and engage target audiences on the local level. The quest to get loyal fans to double click starts with building a franchise profile that followers will recognize at first sight. #1 Create a Handle: This is a relatively simple step—and one of the most important. An Instagram handle should be your business name. If needed, add the city or state of your corporate home at the end; or alternatively, a DBA, or crafty moniker, such as “MeetSOCi.” Remember, Instagram only allows 30 characters in a username. #2 Upload a Profile Photo: Use a crisp, clear company logo as a profile photo. This is your first impression. Make it count for your brand. #3 Write Your Profile Description: Tell your followers who you are and what to expect from your page in the description box. #4 Provide a Link: This element is often overlooked in an Instagram profile. A web link of your choice makes it easy for followers and users to learn about the company, services, and projects. Switch out the link when promoting different campaigns and contests, SOCi recommends. With your profile ready, focus on creative content that builds a must-follow franchise presence. Showcase what the company stands for, how it translates to your products and services, and why your brand is an essential piece to the life puzzle of your followers. Live in High Resolution: Instagrammers scroll quickly through their feeds. Capture and keep their attention with high quality, high-resolution photos. Use the same filter with all shared images for brand continuity. Regram, Regram, Regram: Social fans love user-generated content (UGC). SOCi estimates 93 percent of consumers find visual media helpful when making a purchase decision, and 71 percent feel more comfortable buying a product after seeing UGC. Followers also love getting recognized by brands, often evolving from a fan to full-fledged brand advocates. Make Instagrammable Moments: A storefront that is picture worthy can increase foot traffic, drive sales, increase brand awareness, and build content. Avoid cluttered displays and make products eye-catching and colorful. Don’t forget to harness the power of the hashtag. SOCi estimates seven of 10 hashtags are branded. Hashtags can be the company or any product, phrase, campaign, or contest identified with the brand. Stay Trendy, Go Local: Seasonal, trendy, and relevant content appeals to emotion. Posts related to a holiday, major event, or season will increase engagement and spark discussion. Speak to followers in their language, in familiar places. Entice them with local content from a well-known area or event that targets a specific location. Inspire With Influencers: Partner with social influencers to expand the reach of the franchise. An influencer’s job is to promote your product, brand, and/or service across their profiles and subsequent fan base. If you really want to go for it, provide influencer(s) access to “takeover” your social page for a day to post images, stories, and videos that align with the brand message. Tell a Story: The Instagram Stories feature offers brands an avenue to connect authentically by sharing behind-the-scenes video or multiple photos that appear in a slideshow format. Stories, which disappear after 24 hours, sit prominently at the top of a follower’s timeline. Product walk-throughs, tutorials, or showcasing a service or product are great story-telling strategies. Building a successful brand image means being in the right place at the right time. 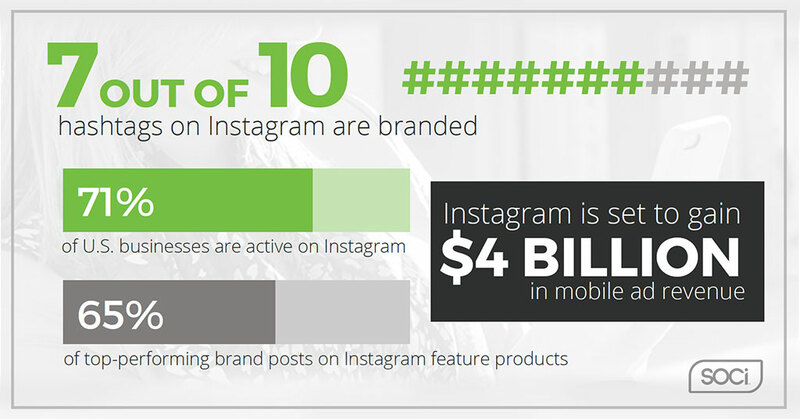 A strong social media game for franchise brands includes Instagram. If you’re interested in implementing a new strategy, or taking your current one to new heights, we’ve got your back. Contact SOCi today!